From the Caravan for Peace’s visit to Austin, Texas. By Elizabeth Brossa, via Flickr. Mexican poet Javier Sicilia’s closed his speech with a call to action Saturday on the steps of the Texas Capitol building in Austin, as part of the Caravan for Peace rally. Sicilia, whose son was murdered by gang members in Temixco, Mexico, in 2011, became the impetus behind the Carvan’s work in Mexico and the United States. Throughout the rally, Caravaners’ stories were interspersed with music, with Sicilia leading off the remarks. Firmly connecting the group’s message to their U.S. audience, he pronounced, “The war is not in Mexico — it’s here. It’s on both sides of the border and only together can we stop this war.” Having started on August 11 in San Diego, Caravan participants will see over 30 U.S. cities in as many days and end in Washington, D.C., on September 12, calling for justice while retelling their trauma. Participants, many of whom have suffered violence and loss due to the War on Drugs, are demanding an end to this ineffective war, along with an end to the criminalization of immigrants in the United States, an end to the militarization of the U.S.-Mexico border, an end to the sale of arms across the border and an end to money laundering. In short order, they want an end to the violence. The war on drugs, financed principally through the Mérida Initiative, carries a $400 million price tag. According to one example of State Department doublespeak, the Mérida Initiative seeks to “Provide significant support to … forge strong partnerships and increase citizen safety.” Ironically, rates of human rights abuses committed by law enforcement officials doubled during the first six months of the Mérida Initiative’s implementation in 2008, and there were over 400 related deaths in Mexico throughout the first 25 days of 2009. Under the Mérida Initiative, numerous Mexican law enforcement and military officials have been sent to the Fort Benning, Georgia-based School of the Americas, a military training school accused of condoning torture tactics and human rights abuses. He went on to share how the ransom calls began, and explained that though his family paid what they were asked for the safe return of his brother, they never saw him again. Although many participants shared similarly horrifying stories of violence, they also made it clear that this kind of violence doesn’t only affect Mexican citizens. The militarization of the border also results in increased danger for those who wish to cross it, making human trafficking an even more profitable endeavor. This increases the violence and danger faced by those who wish to cross, or are forced to cross against their will. Upon arrival, migrants, often fleeing for economic or political reasons, face serious challenges in their attempts to find stable work, housing and some sense of normalcy — while also coping with the trauma of their experiences during their time in the United States. Participants in the Caravan cried out against this migrational violence, which is compounded, they said, by a federal immigration policy that criminalizes and imprisons newly arrived undocumented immigrants. Caravaners are seeking letters of support and resolutions signed by local government officials to this end. The Carvan’s stop reached approximately 500 Austin locals on Saturday, including members of various local immigrant rights and worker organizations, and there was a strong presence of culture woven throughout the rally by local musicians and cultural groups. Given that the Caravan was initially motivated by a poet, it comes as no surprise that its presence in Austin suggested a form of resistance enacted through music and culture. Local danzantes, people who form part of a traditional Aztec ceremonial dance group, were present to open and close the activities of the day. Other musicians present included Kiko (of Austin’s Kiko y La Banda), and a small cluster of jaraneros, musicians who play traditional Mexican folk music on small guitars called jaranas. While on stage, Kiko shared his experience as a Colombian dealing with the war on drugs in his home country, and two jaraneras thanked the crowd for their presence while giving voice to the trauma of border crossing and assimilation through their music. Later, one of the jaraneras reported that, for her, the purpose of participating in events like this is to rescatar, or to rescue, cultural practices from Mexico that have historically been a way of communicating messages about justice and struggle. Perhaps the take-away from this display of culture is a sense of rootedness and familiarity for migrants on this side of the border, despite the distance from home. 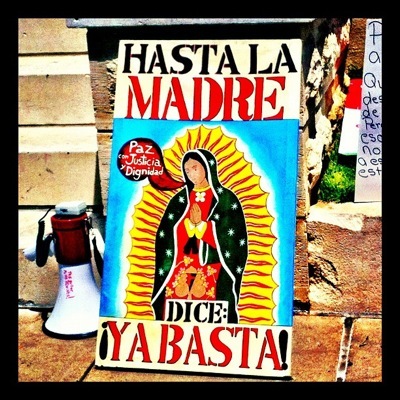 For Austin attendees, the messages of solidarity and hope combined with the show of culture to offer a historicized and politicized sense of place, while conveying the significance of connecting local struggles for justice with the struggle for the right to live in peace and with dignity. As the Caravan moves into the Deep South, it will stop in Fort Benning, Georgia, the location of the School of the Americas and the annual protest to close the training center, before moving on to Chicago, Cleveland, and the eastern seaboard before reaching Washington, D.C., on September 10. Thank you, Kandace, for reminding us of the costs of the war on drugs, and your description of resistance through music and culture. The War on Drugs has been on of the best self perpetuating crisis ever manufactured. Step 1- Create a problem, Step 2- Create a “solution” that makes it worse and Step 3- Demand more money and power to solve the problems caused by the “solution” all the while trampling on civil liberties. The day we end the war on drugs is the day we can start our path to having crime and incarceration rates that are on par with other industrialized nations. And then maybe Mexico will have a chance at some peace, development and growth.